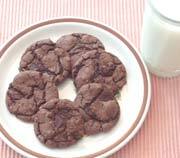 A devil's food cake mix brings you the chocolatiest cookies ever! Beat half of the dry cake mix, butter, vanilla and eggs in large bowl on medium speed until smooth, or mix with spoon. Stir in remaining cake mix, nuts and semi-sweet chocolate. Drop dough by rounded teaspoonfuls onto ungreased cookie sheet about 2-inches apart. Bake 10 to 12 minutes or until edges are set (centers will be soft.) Cool 1 minute; remove from cookie sheet to wire rack.